Displaying limited time offers on your site is one way to generate more interest in your business. The Page Expiration Robot can help. It is a countdown timer plugin that lets you schedule pages and posts to expire at a certain time. Once a page is expired, your visitors are redirected to a different URL. Page Expiration Robot shows your custom message and images upon expiration. It can expire posts on a visitor-by-visitor basis. The timers are responsive and optimized for mobile devices. You can use them in posts and pages. The plugin is available for free but you can get premium extensions for unlimited campaigns, more countdown styles, and other features. 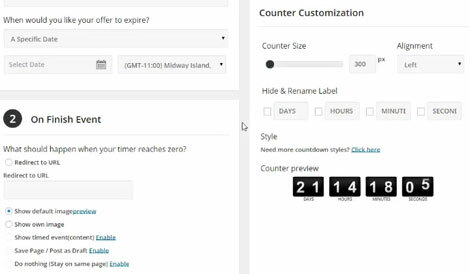 You can customize styles, alignment, counter size, and other settings from the back-end. The plugin also gives you plenty of control on what should happen when pages expire. You can get it here.